1. In a pressure cooker add the channa, water and pressure cook for 10 minutes or 7 whistles (i like my channa to be soft yet firm). Switch off the flame and let the pressure gradually settle. 2. In a kadai heat oil and roast the ingredients one by one given under to grind - red chilli, coriander seeds, coconut for 2 minutes switch off. Let this cool completely. 3. Add this to a blender and make into a fine paste along with ginger. 4. In the same kadai heat oil, splutter the mustard seeds, add the curry leaves, now add in the chopped onions sauté until transparent. 5. Add the puréed tomato and add in the salt cook for 3 minutes until the raw smell goes away. Now add in the puréed masala let it cook in medium flame for 2 minutes until thick. 6. Add the channa along with the water and let this boil and cook for 4-5 minutes. 7. Switch off, serve warm along with puttu. 1. I love my channa to be well cooked, hence I cook them for 7 whistles you can reduce it to 4-5 whistles if you love them to be a bit firm. Skip salt while pressure cooking channa this speeds thee cooking time. And I soak the channa for overnight (Approx 12-15 hrs). 2. You could thicken the curry by adding more coconut, since there is coconut in the puttu I reduced the quantity. 3. Shallots/small onions add loads of flavour to this curry so don't skip them. 4. Amma made this into a mild curry, if you want it more hot and spicy add spices like red chilli powder and coriander powder. 1. In a bowl add the ragi flour and salt mix well until the salt in evenly distributed. 2. Sprinkle water little by little and mix into the flour making sure you rab theflour between your palms using single hand/ both hands. The more evenly the water is spread the softer the puttu will be. 3. Repeat this second step until the flour is moist and not wet, it took me 3-4 times of sprinkling of water. This requires patience and practice. Do not make this mixture damp or wet and make sure there is no lumps in the mixture. 4. To check if the consistency has reached, take a ball of the flour and try to press between your palm and fingers the ball of flour must hold firm without breaking. 5. Once this stage has reached cover the flour mixture for 10 minutes with a plate. 6. 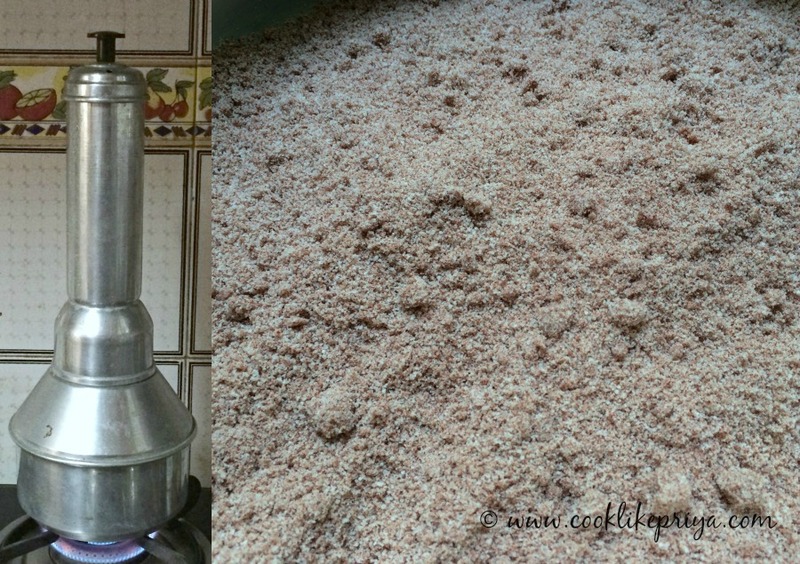 Prepare the puttu maker by adding water to the base vessel and add shredded coconut into the tube like vessel and layer with the ragi flour mix. 7. Alternate the coconut and the ragi flour until all the flour and coconut is used up. 8. Cover the lid and let it cook for 8-10 minutes. 9. Once done slide the fresh hot puttus using a spoon from one end such that the puttus fall out from the other. 10. Serve along with kadala curry/ banana/ sugar/ jaggery. 1. Make sure you mis the water into the ragi flour in batches and do not pour the water to the flour. Sprinkling and even mixing results in soft puttu. 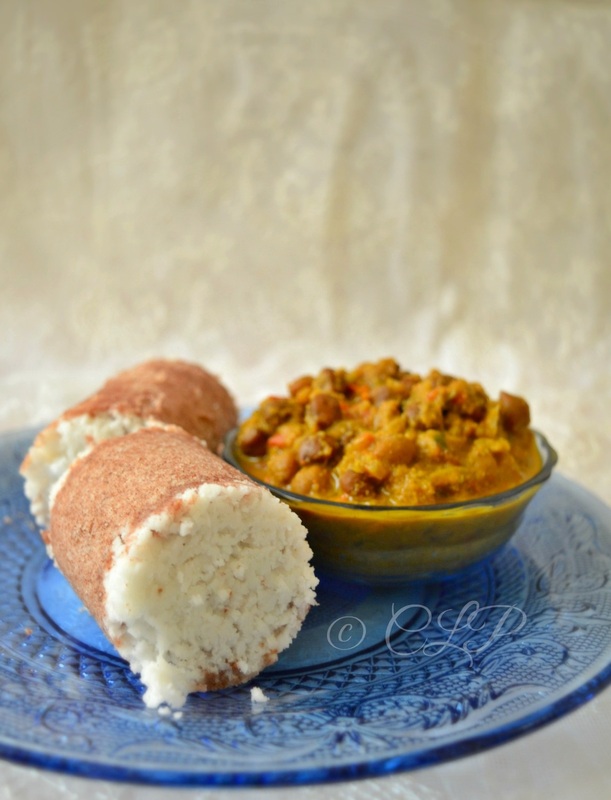 The puttu flour should never be too wet but slightly damp and when held within the palms it must stay firm. 2. Greasing the puttu mold is not necessary. In case you do not have puttu maker then you can line the idly plate with putt mix and steam cook for 10 minutes with out with using a cloth lining in the idly plates. 3. 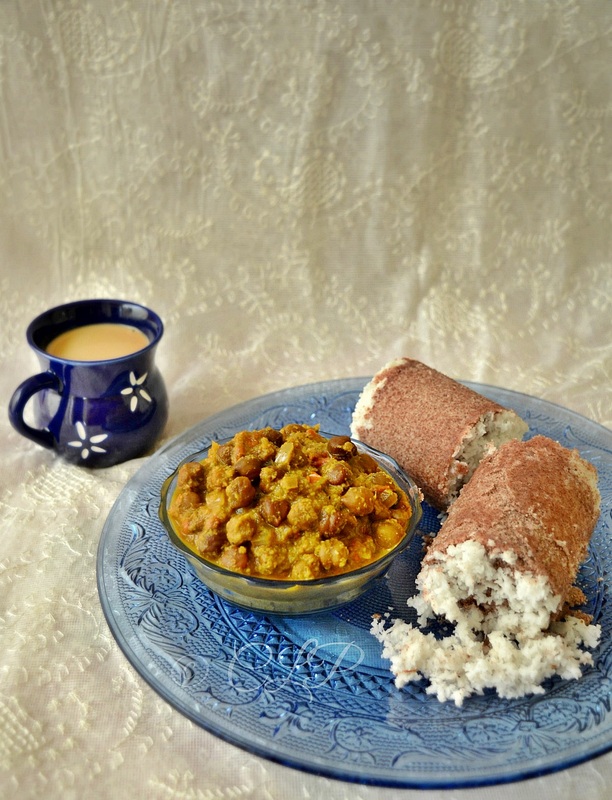 The same recipe can be used to make white puttu just skip the ragi flour to rice flour. Using idiyappam flour works best. 4. Take care while unmolding the puttu maker and directly plating them in the serving platter. Puttu is great while enjoying them warm. healthy combo.. I got this recipe from my friend still haven't tried at home..
Would love to start my day with this healthy dish. I don't know what is puttu and also puttu maker is available in the market!!! This is so new to me and I guess it needs lots of patience to make such a wonderful dish. 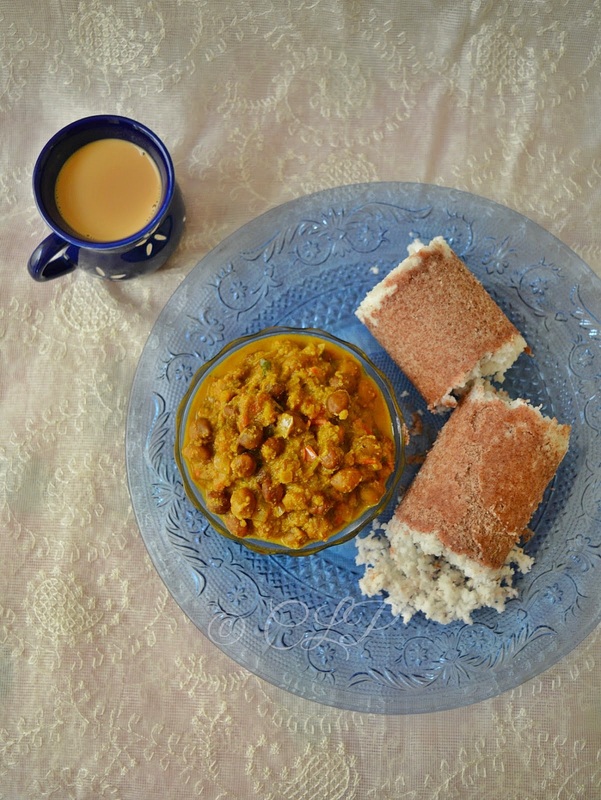 Ragi puttu is my favorite, this kerala style puttu and kadala curry is perfect for a wholesome breakfast! Beautiful props and neat presentation da...love it!